In this tutorial we create a neural network that approximates a function defined by a set of data points. The data for this application can be is stored in the data.csv file. The start page is shown. 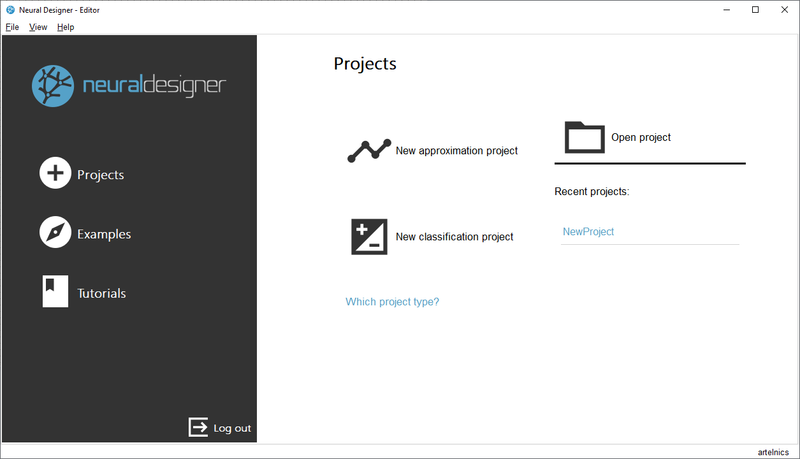 Click on the button "New approximation project". Save the project file in the same folder as the data file. The main view of Neural Designer is shown. In the "Data set" page, click on the "Import data file" button. A file chooser dialog will appear. The program loads the data and sets the default configuration. This data set has 2 variables and 21 samples. -The first column represents the independent variable, or "Input", x. -The second column represents the dependent variable, or "Target", y. We leave that default values. -60% of the data is used for training. -20% of the data is used for selection. -20% of the data is used for testing. Once the data set is configured, we can run some related tasks. For instance, in the "Task Manager", click on "Data set> Plot scatter chart". The viewer window will appear with a chart of the data. As we can see the shape of this data is a sinus function. In any project, the quality of the data must be checked by running different data set tasks. Click on the "Neural network" tab to configure the approximation model. The next screenshot shows this page. The "Perceptron layers" section is the most important one here. By default, the number of layers is 2 (hidden layer and output layer). By default, the hidden layer has 3 neurons with hyperbolic tangent activation function. As we have 1 target (y), the output layer must have 1 neuron. The default activation function here is the linear. To visualize the network architecture, click on "Task manager> Neural network> Report neural network". The viewer window will appear with a graph of the network. In the training strategy page the information about the error method and the optimization algorithm is set. The next figure shows this page. The "Normalized squared error" is the default error method. A regularization term is also added here. The "Quasi-Newton method" is the default optimization algorithm. The most important task is the so called "Perform training"
which appears in the list of training strategy tasks from the task manager. Running that tasks the training algorithm minimizes the loss index, i.e., makes the neural network to fit the data set. The following figure shows the results from the perform training task in the viewer window. 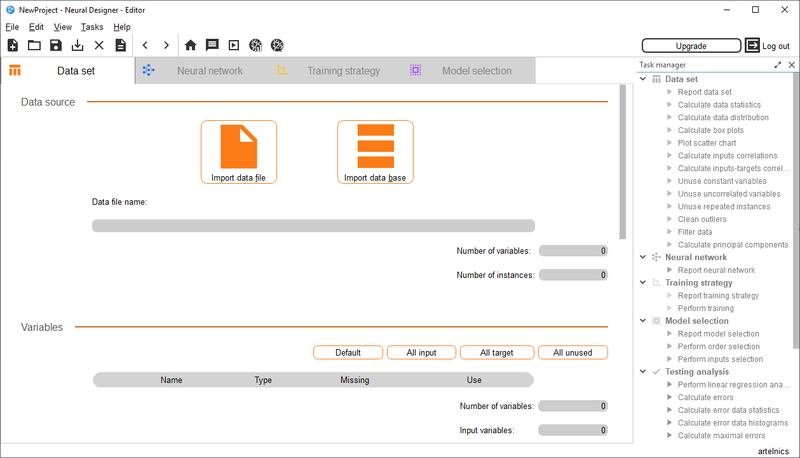 Neural Designer provides innovative algorithms to automate the model selection process. Model selection is applied to find the topology of a neural network that minimizes the error on new data. There are two ways to obtain an optimal topology, order selection and inputs selection. Order selection algorithms are used to get the optimal number of neurons in the neural network. Inputs selection algorithms are responsible for finding the optimal subset of inputs. When the neural network is designed and trained, Neural Designer offers diverse tasks to test the result offered by the model. For instance, the task "calculate confusion" depicts a table containing the data of a confusion matrix. Each column of the matrix represents the instances in a predicted class while each row represents the instances in an actual class. Once the model has been tested, it is ready to make predictions. Model deployment tasks allow you to calculate directly outputs, calculate output data in a file, plot directional output, calculate jacobian, write the expression of the predictive model or export the expression for Python and R.